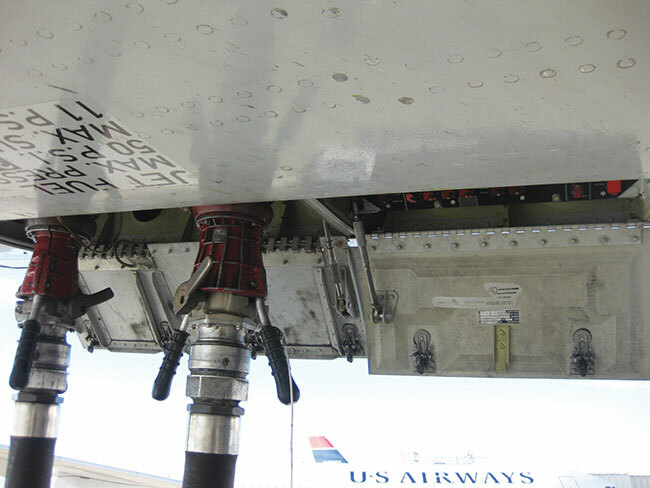 Jet fuel prices are on the rise which usually means the higher costs are passed on to consumers through higher fares. 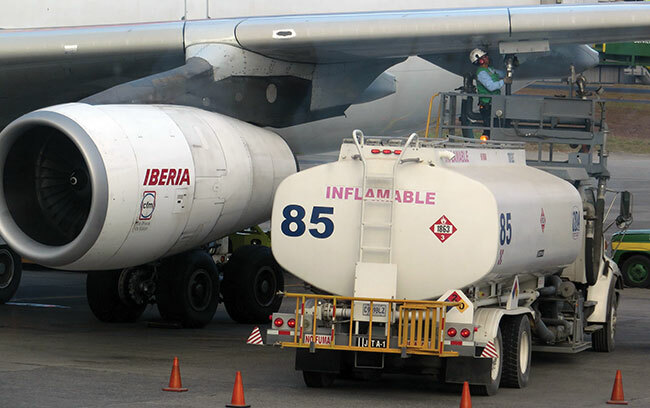 During the second quarter, the average price of jet fuel was 83 cents a litre, up 37 per cent over the 60 cents average during the corresponding period from a year earlier. 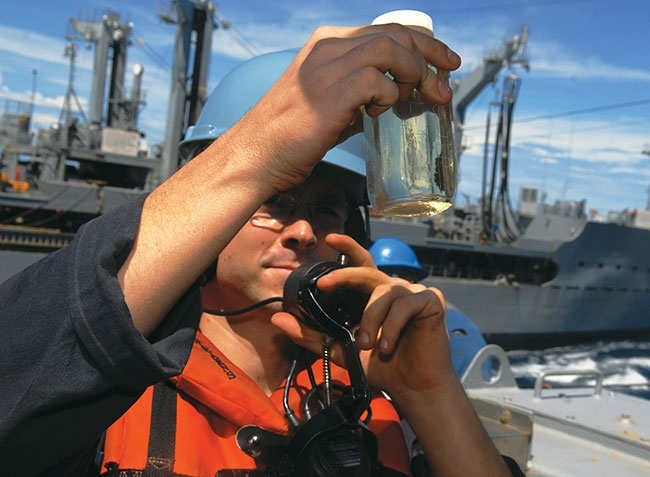 A machinist’s mate inspects a sample of JP-5 jet fuel aboard an amphibious transport dock ship. The price of 84 cents a litre at the beginning of August was well above the 75 cents forecasted for the third and fourth quarters of the year and the 70 cents average for 2019, according to an industry report by Cameron Doerksen of National Bank of Canada. A weaker Loonie will also have a negative impact on Canadian airline costs, since fuel is priced in U.S. dollars in addition to aircraft maintenance and aircraft leasing which are also priced in USD. Following their most recent quarterly results, both Air Canada and WestJet said they would indeed offset higher fuel prices with higher fares and may decrease capacity in the fourth quarter, as expected. Air Canada reported revenue was up 10.4 per cent to $4.3 billion in the second quarter ended June 30 versus $34.91 billion a year earlier, but earnings decreased to $114 million from $226 during the same period. “We estimate that we will be able to mitigate approximately 75 per cent of the expected 2018 annual fuel price increase through fare increases, other commercial initiatives and our cost transformation program,” said Air Canada CEO Calin Rovinescu. After reporting a loss of $20.8 million in the second quarter, which it attributed to a threatened pilot strike, increased competition and higher fuel costs, WestJet said its ultra low-cost carrier (ULCC) Swoop is expanding service into the U.S. “to help migrate the five million Canadians who are crossing the border to Buffalo and Bellingham and make sure that there’s less need to travel on North American counterparts,” said WestJet CEO Ed Sims. The company has also reduced its plan for full-year capacity growth to between 5.5 per cent and 6.5 per cent, compared with the previous estimates of between 6.5 per cent and 8.5 per cent. The impact of the potential pilot strike will linger into the third quarter, WestJet officials said, because some people cancelled bookings they had scheduled for July. As a result, WestJet will cut the number of available seat miles by six per cent and is examining routes to see where they can be cut, executives said on a conference call. WestJet is examining how it can tolerate marginal routes when jet fuel prices are low compared with when they are high, chief executive officer Ed Sims said on the call. Swoop began flights on October 11, 2017, to Las Vegas from Abbotsford, B.C., and Edmonton, about four months after it began operations. More services were added a couple of weeks later between Hamilton and Las Vegas as well as to Fort Lauderdale, Orlando and Tampa Bay. Flights between Edmonton and Phoenix were scheduled to begin October 27, 2018. “Our surveys show that transcontinental pricing has been weaker relative to other routes (short-haul eastern and western Canadian), although we are encouraged by the fact that in the back half of 2018, Air Canada is reducing some capacity between Toronto and Vancouver (with WestJet adding only one to two per cent more seats), which may help yields,” said Doerksen. Air Canada seems to be in a better position financially than WestJet, which is facing some challenges, including continued labour uncertainty, risk related to several strategic initiatives and the potential for more yield pressure, suggested Doerksen. While WestJet successfully launched Swoop, the company faces other hurdles such as the expansion of its international route network as new 787 widebodies begin to arrive next year. In addition, a major adjustment is taking place in the airline’s network to focus on connecting hubs in Calgary, Toronto and Vancouver and a new focus on attracting premium travellers. “We believe WestJet is more at risk of seeing downward yield pressure as it competes more directly with new ULCC capacity (Flair) using its Swoop arm,” explains Doerksen. “WestJet’s strategy to take market share as it grows internationally may also subject it to more yield pressure in the coming years.” Flair is a small competitor (less than three per cent of total industry domestic seats), but in June it launched a major route expansion that will see its total seat capacity up 280 per cent in the second half of 2018. There has been a succession of fare promotions from Flair in recent weeks including $19 base fares on select routes, two-for-one sales and kids-fly-free sales. Swoop has similarly been promoting very attractive fare deals in the early days of its launch. Of concern to Doerksen is that many of these fare promotions were available for travel during the peak summer season. While the routes these two airlines fly represent only a fraction of the total domestic market, he expects some downward pressure on WestJet yields in particular as a result of direct competition between Swoop and Flair. City-pairing fares on the ULCC carriers are generally lower. Also of note is that Air Canada is now offering a Basic Economy fare on certain routes where there is a competing ULCC fare. If the ULCC carriers continue to expand, the analyst expects Air Canada to further expand its Basic Economy fares as a competitive response. On its most recent conference call in mid-June, Air Transat indicated that its trans-Atlantic prices were down one per cent this summer and suggested its competitors were pricing economy fares on the low end, aiming for yield improvements in the premium cabin. Doerksen thinks Transat is likely underperforming Air Canada (and possibly WestJet as well) on trans-Atlantic prices as it does not have the connecting feed that the network carriers enjoy. In addition, as a leisure-focused carrier, Transat may be more impacted by low-cost operators like WOW, Primera and LEVEL, which are chasing market share growth this summer. Air Canada is planning an increase of over nine per cent on U.S. trans-border routes in the last half of the year. While this seems relatively high, according to Doerksen, he believes the expansion is supported by the continued growth of it sixth freedom connecting traffic. He also suspects that American Airlines’ 9.9 per cent capacity increase is in response to the termination of its codeshare arrangement with WestJet, which resulted from WestJet’s planned trans-border joint venture with Delta.